Just had the same "clutch inop" issue occur on my 2013 TEX this month with 12k miles on it. I was fortunately given a warning the day before the clutch went completely out. The warning was, the clutch engagement/disengagement point for a few shifts started happening alot closer to the grip than it normally did. I was on an extended trip 400 miles from home when it happened, but fortunately, trailered the bike for this trip, so wasn't put out at all. Just pushed the bike onto the trailer and got it home. After adding DOT 4 fluid to the empty clutch reservoir and pumping the lever a few times to work its way down the line, and doing it again a second time when it didn't work the first time, I finally "punted" and decided to just take it to the dealer for a proper diagnosis, which came back with a blown seal in the slave cylinder (between the piston and cylinder). $90 for the slave cylinder and another 1.5 hours of labor will bring the repair to ~$245 US. Glad I looked at this forum. Wouldn't have known that an engine oil change was necessary whenever a slave cylinder leak occurs. I too was perplexed with "where did all that DOT 4 go" as others were when I didn't see any fluid on the bike or on the ground. Leaking into the engine crankcase explains it. Will confirm that with the dealer tech (that the engine oil should be changed) when I pick it up (still with the dealer--should be done soon). That's an odd design flaw. The first Hinckley Triumphs had a small chamber between the slave cylinder and the seal for the clutch pushrod entering the engine, with a drain hole to avoid exactly this problem. Had I known what the issue was, I would have considered buying the $90 clutch slave assembly and gasket and replacing this myself. It didn't look all that difficult to replace. But when you've never dealt with an issue like this before (although some Tiger Forum posters appear to have), and neither did the dealer tech who repaired it (he said he worked at the Triumph dealership for 8 years and never saw one like this happen before), you get the dealer expertise with your dealership experience. Spent $130 for the labor portion of the repair (1 hour), which I thought was fair. High, but fair. $241 in total (included brake fluid, etc.). On the ride home from the dealerhip (~21 miles) clutch engagement during a slow easing-out of the clutch lever was notchy (felt it shuddering). It was fine after the clutch lever was let all the way out. The tech said to see if that goes away after the engine oil change. The shudder diminished after the oil change (changed it as soon as I arrived home). Still there, but not as bad. Not riding it much more now for the 2018 riding season. I generally stop riding when temps hit 40 degrees--I have other "fun transportation" options. Hoping that the brake fluid on the clutch disks eventually wears off next season. For what its worth, my tech said the replacement slave piston and cylinder (Triumph part) design was new. 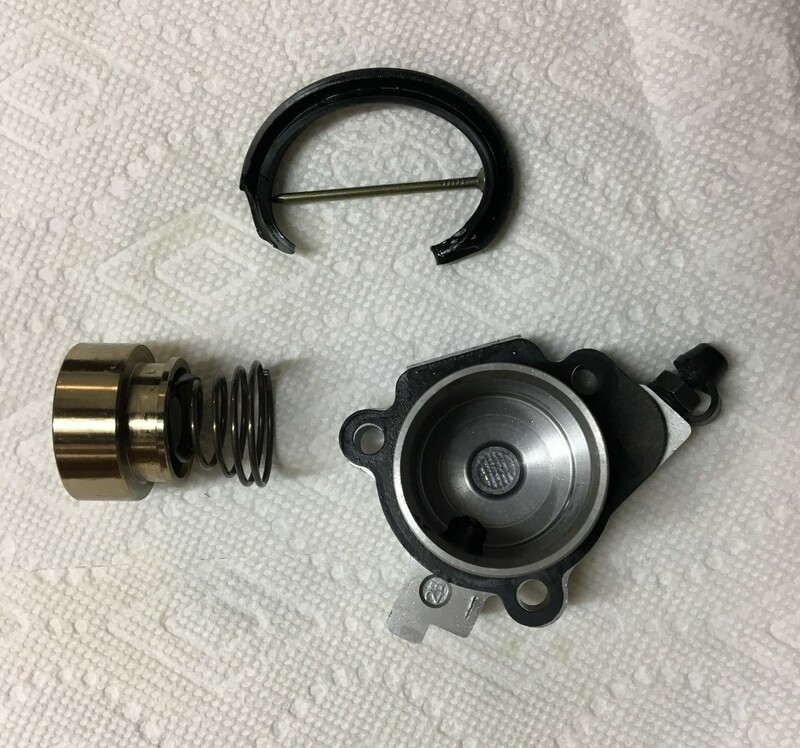 It has a double-seal design now, which did make me feel better about lowering the likelihood of this happening again, but one of my riding buddies has a 2013 Trophy SE (40k miles) that he rides pretty darn hard with the same engine that this hasn't happened to. Oh well. It's over. I'll just have to keep my fingers crossed that the shuddering goes away next season andi the new double seal design does the trick. My clutch shudders on engagement, most noticeably when the engine is cold or when the engine is hot and stuck in stop-and-crawl traffic. I have learned to ignore it. Most of the time, it goes away after the engine gets up to operating temperature. I'll just have to keep my fingers crossed that the shuddering goes away next season andi the new double seal design does the trick. Just for your peace of mind, I had two Mk1 ('12 and '14) and one Mk3 (now stranded but that's another story). None of them ever exhibited any clutch problem whatsoever. This a total 6 years and much more than 100,000 km covered. Based on what the dealer tech told me, your experience is indeed one of the more common ones--no hydraulic clutch issues. BTW...just read about a Harley Davidson hydraulic clutch recall today affecting 283,000 of their 2017 and 2018 motorcycles. My 2012 Road King has a cable clutch.